Back in September 2005, I wrote Actually, No. about Citibank’s self-defeating fraud department, and the follow-up two months later Reply from Citibank which was just a form letter noting that they had received my complaint. In that situation, their fraud department would call from an unverifiable number, potentially leaving a voicemail for you, asking you to call them back at an arbitrary unverifiable phone number, where they immediately ask for your account details to verify a transaction. As far as I know they still continue that asinine behavior. Today, I got a new one: Citibank called to verify a transaction (presumably a large-ish payment I made to a new payee using online bill pay), and the caller asked me to verify receipt of an SMS message (“for security reasons”) by reading him the numeric code it contains, in order to verify they are in fact speaking to me. I told him that I received the message, but I was not comfortable giving him the code, as I could not verify who he is. I explained that he could just as easily be trying to e.g. gain control of my account and needing the verification code to complete a password reset or similar (social engineering me). I told him I would call the number printed on the back of my card, and asked him how to get back to him when doing so. He said he would leave a note on my account. Of course, when I called back and authenticated to the agent, the agent tried to internally transfer me to the number left in the note (the fraud department), but instead got a message saying the department was closed (open only until 6pm Eastern time) despite someone from that department calling me literally 1 minute prior. It took the customer service agent tracking down the specific employee who left the note, and messaging him, to get me transferred to his personal extension, since going through the department extension wouldn’t work. In the end, it was in fact Citibank’s fraud department calling me, we verified the transaction they wanted to verify, and everything is cool on that end. However, the bigger issue is that Citibank’s “fraud department” procedures are asinine and extremely self-defeating. I guess it’s time for another complaint to the executive office, and probably another form-letter reply. Many DBAs know that building indexes in “random” order (or really any order that greatly differs from ordered by key) can be much less efficient. However, it’s often hard to really understand why that is. 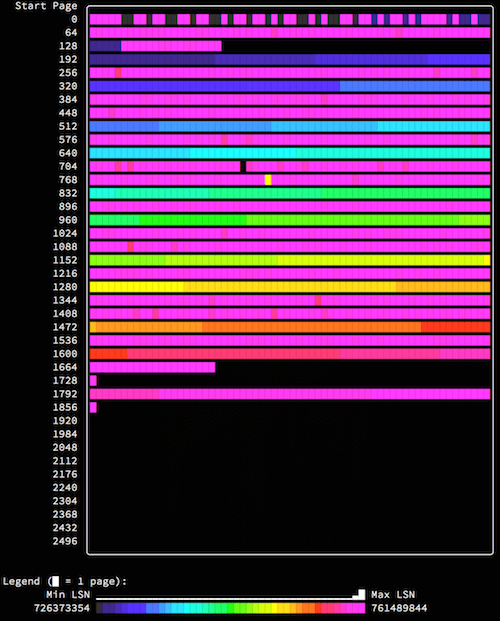 With the “-illustrate” visualization modes available in innodb_ruby, it’s possible to quite easily visualize the structure of indexes. 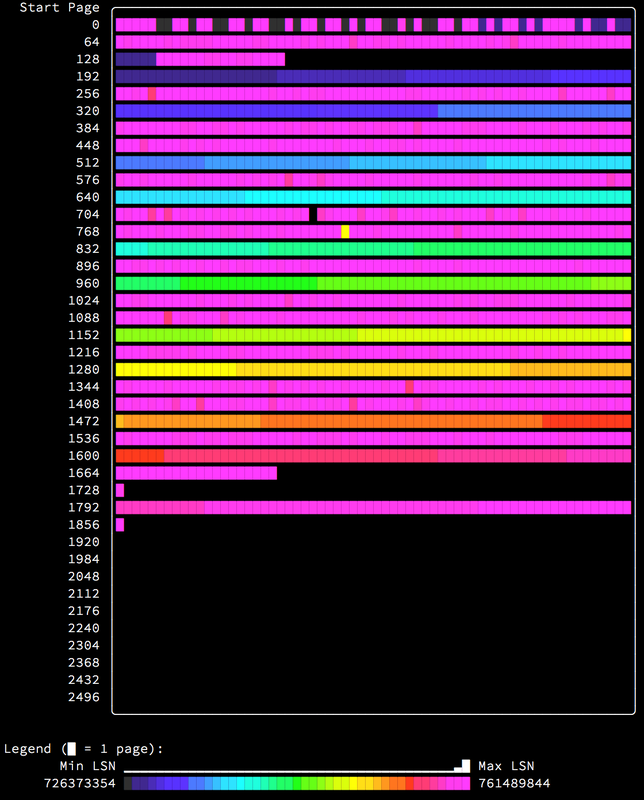 The space-lsn-age-illustrate mode to innodb_space allows visualization of all pages in a space file by “LSN age”, generating something like a heatmap of the space file based on how recently each page was modified. 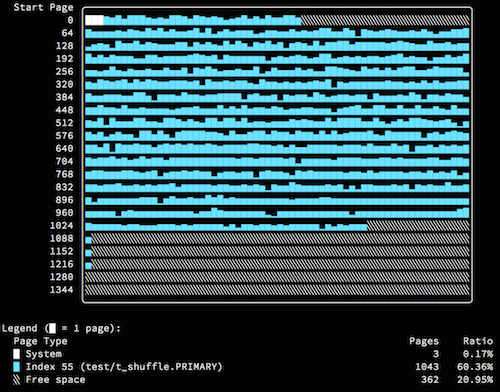 Pages can be filled completely, and the database (with sufficient optimizations present) can detect the “bulk loading” behavior and efficiently split pages by creating new, empty pages, rather than splitting pages in half. Only the “edge” of the index is being written to; once a page has filled it will not be revisited. This can make the buffer pool, which caches database pages, much more effective. As you can see in the above image, the index pages are written to in nearly perfect order as they are allocated from the beginning of the file towards the end. The first extent (the first line of the image) is allocated as a fragment extent, and contains single pages allocated for different purposes. You can clearly see the tablespace bookkeeping pages, FSP_HDR at page 0 and INODE at page 2, immediately followed by the root index page at page 3, all very recently modified. Following that are 32 individually allocated “fragment” pages which were allocated first in the index before it switched to allocating full extents. Then the index pages progress perfectly until the end of the used space. Also note the LSN age histogram (printed in white above the colored legend at the bottom) shows all buckets equally filled. Because the rows were inserted in completely random order, every page has an equal chance for insertion. 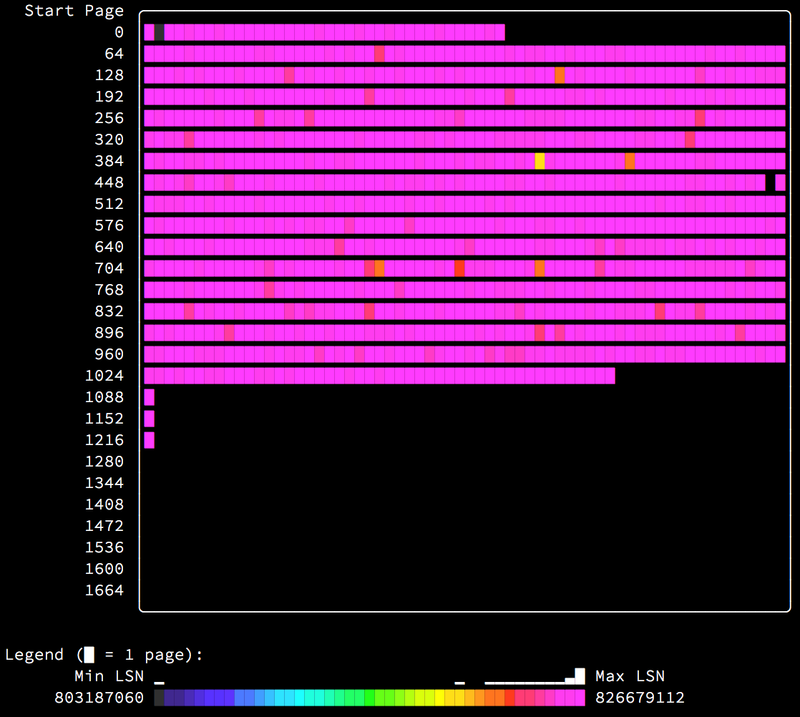 This means in practice that every page is very recently modified, and this is clearly visible by the entire heatmap being purple. What this also means is that the entire table must be continually present in the buffer pool, and if it doesn’t fit, performance will suffer greatly. This is the main reason that performance of insertion in random order is terrible. Additionally, you can see a few misbehaviors of InnoDB: Note the extents starting at page 1088, 1152, and 1216. Why do you think they look like that? Let me know your ideas in the comments. Notice that this looks like the previous cases perfectly interleaved together, because it is exactly that. Since the primary key and secondary index contain completely different data, insertion is ordered by the primary key, but completely mis-ordered by the secondary index, resulting in the secondary index being built inefficiently. When the index is built on the existing table (via ALTER TABLE ... ADD INDEX), it is built by scanning and sorting the data before insertion into the index, resulting in an optimal (and very fast) index build. 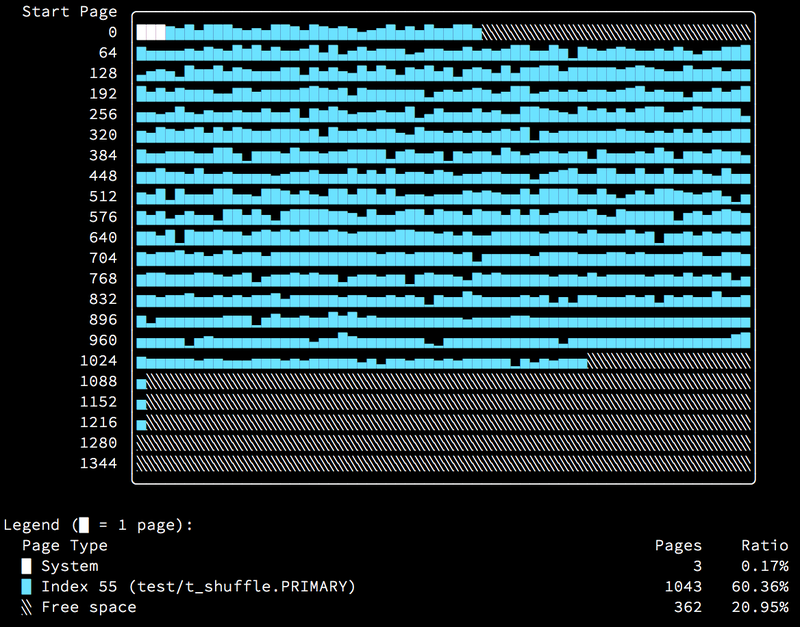 The random-ordered insertion caused pages to be split more frequently, and in some cases to be severely under-filled, causing a very poor page fill rate on average. Those of you who are particularly observant will have noticed that the index illustrations in the first pictures above showed that the ordered-insertion index is significantly smaller than the random one. You can see here that the random-insertion index is 41% larger at 1043 pages compared to just 737 pages for the ordered-insertion index. Additionally, 206 more pages are left unused, making the actual disk space usage 57% larger. It’s been almost 4.5 years since, during some code refactoring, it was decided (or accidentally changed?) that sql_log_bin should become a GLOBAL variable as well as a SESSION one. Almost 2 years ago, during MySQL 5.5 upgrades at Twitter, I filed MySQL Bug 67433 describing in detail how stupid and dangerous this change was, and asking for a reversal. Nothing has been changed or reversed, so SET GLOBAL sql_log_bin continues to be allowed. I continue to directly see, and hear about damage caused by incorrect use of SET GLOBAL sql_log_bin. So, let me describe just how stupid and dangerous it really is. What really happens when you run SET GLOBAL sql_log_bin? If you have a master-slave replication configuration, your master will have binary logging enabled (log_bin) and be recording each transaction to its local binary logs, which the slaves read (more or less in real time) in order to replicate. This log must be complete for replication to be useful and trustworthy. If it is incomplete, serious data loss may occur. It’s been possible for a long time to use SET [SESSION] sql_log_bin=0 within a connection (with a SUPER user) to temporarily disable binary logging of a session. This can be quite useful to be able to run e.g. ALTER TABLE commands without having them immediately replicated to the slaves. Most people would guess that running the very similar SET GLOBAL sql_log_bin=0 would disable binary logging for all sessions (you know, GLOBAL?) immediately. However, that’s not quite the case. Global-only: The variable only exists, and only makes sense, in a global scope. An example is innodb_buffer_pool_size — there is only one buffer pool, so it makes no sense in any session context. These variables may also be read-only, so that they can’t be changed at runtime. Global and session: The global variable defines the session default, and is copied to the session variable on connect. A user may change the variable within their session if they want, and there may be restrictions on doing so. If the global variable is changed, it will only affect new sessions; existing sessions will keep the variable they copied at session start. A typical example of this is max_allowed_packet. Session-only: There is no global variable associated with the session variable. A user may change the variable only within their session. The sql_log_bin variable was previously Session-only and with the commit mentioned above, it was made Global and session. When a session is initiated, it copies its sql_log_bin value from the global scope to its session scope copy. If the DBA issues SET GLOBAL sql_log_bin=0, it only affects new sessions, any already-connected sessions will continue logging. This makes it pretty useless for managing a failover. Changes to the global variable using SET GLOBAL do not even affect the currently connected session; issuing SET GLOBAL sql_log_bin=0 within a session does not prevent the following commands in that session from being binary logged. This is actually often the first sign that something didn’t work as the DBA expected—they suddenly find all slaves to be executing something they thought they had prevented from being replicated. If a connection is made while sql_log_bin=0 and the DBA then issues SET GLOBAL sql_log_bin=1 the sessions which started while it was 0 will continue to not log anything to the binary log for as long as they are allowed to stay connected. This also makes it pretty useless for managing a failover. If the DBA accidentally issues SET GLOBAL sql_log_bin=0 briefly, even for milliseconds, the entire master-slave replication topology may be irreparably damaged and if this is done without immediately noticing it, permanent and severe data loss may occur. Is anyone putting it to good use? Regarding to “revert” I don’t agree: with global access it is possible to make a server master online, without bringing it down. If you Google search for “set global sql_log_bin” you can find plenty of examples of people talking about it in various languages. I couldn’t find a single example of a script or person using or describing its use correctly, and I looked through pages and pages of examples. 这几年犯的错 (“recent mistakes”) describes someone who accidentally used SET GLOBAL sql_log_bin in a production environment and had to spend a lot of time repairing the damage. Easiest way to sync a dev MySQL db to a production MySQL db? someone describes a sketchy way of managing a desynced prod-staging environment. MySQL Replication FAQ shows someone’s DBA notes, using it incorrectly. 总结：MySQL备份与恢复的三种方法 describes exactly the wrong and extremely dangerous procedure for executing a mysqldump on only the master. 标题：MySQL 参数浅析之 sql_log_bin describes how to properly use sql_log_bin, with a stern warning about the GLOBAL version of it being dangerous. ZabbixのDB(MySQL)をパーティショニングする provides a Zabbix monitoring script, which if used with the provided sample SET GLOBAL sql_log_bin commands will completely destroy your production environment. 标题: MySQL备份与还原 shows someone else providing bad advice on a forum. リストアの高速化 shows yet another person providing bad advice for how to make restores go faster. Also notably, the MySQL manual text for sql_log_bin also still does not adequately describe or warn about its behavior. Do the right thing, and revert this change. We even provided a patch. Update: Morgan Tocker, MySQL Community Manager at Oracle is requesting feedback on the future of SET GLOBAL sql_log_bin. Go and make your opinion known! Just under a year ago, on June 14, 2013, I reported MySQL Bug 69477 (and MariaDB Bug MDEV-4662) titled “InnoDB: Use of large externally-stored fields makes crash recovery lose data”. The gist of this bug is that if you use large BLOB fields (> ~10% of your InnoDB redo logs size), you can compromise crash recovery and suffer data loss after a crash. The MySQL bug was marked as “Verified” in less than an hour (wow! ), but since then there was not a single word about it. Suddenly a couple of days ago, I got an email with “[Com,Ver->Csd]” in the subject. My immediate thought was “Damn it, closed?! How can they close it?! It’s a bug!” — however, upon opening the email I noticed it was not closed as “Won’t fix”, but rather, it was fixed! Redo log writes for large, externally stored “BLOB” fields could overwrite the most recent checkpoint. The 5.6.20 patch limits the size of redo log “BLOB” writes to 10% of the redo log file size. The 5.7.5 patch addresses the bug without imposing a limitation. For MySQL 5.5, the bug remains a known limitation. The limitation has also been documented in the reference manual. The changes should appear soon, with the next published documentation build. Thanks, Oracle, for fixing1 this bug! I look forward to seeing the fix in both 5.6 and 5.7. I was just thinking the other day that I might have to fix it myself, because it seemed like nobody was working on it. Since MySQL 5.6, InnoDB supports adjustable page size through the new configuration parameter innodb_page_size1, allowing you to use 4 KiB or 8 KiB pages instead of the default 16 KiB pages. I won’t go into the reasons why you would want to reduce the page size here. Instead, coming back to MySQL Bug #67963… neither the number 62 nor 16384 are fixed; they are in fact variable. The number 62 actually comes from the size of the extent, in pages. 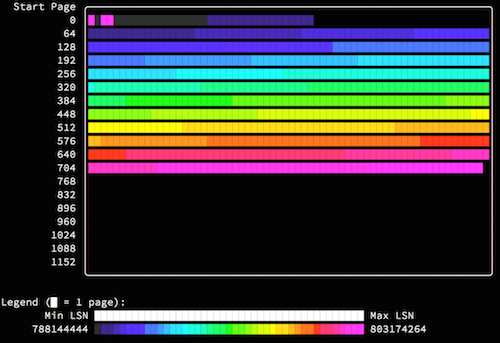 For 16 KiB pages, with 1 MiB extents, this works out to 1048576 / 16384 = 64 pages per extent. Since two pages are stolen for bookkeeping, that leaves the 62 pages above. The number 16384 comes from InnoDB’s need to repeat these bookkeeping pages every so often — it uses the page size, in pages, for this frequency2, which means that for 16 KiB pages it repeats the bookkeeping pages every 16,384 pages. If we use 8 KiB pages instead by setting innodb_page_size=8k in the configuration? 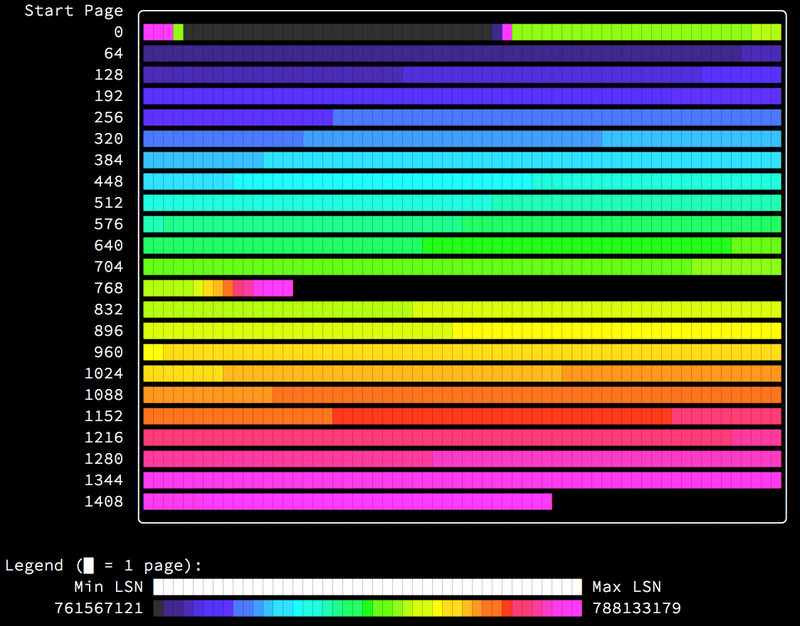 The number of pages per extent changes to 1048576 / 8192 = 128 pages per extent. The frequency of the bookkeeping pages changes to every 8192 pages. So we now waste 126 / 8192 = ~1.5% of disk space for this bug. If we use 4 KiB pages instead by setting innodb_page_size=4k in the configuration? The number of pages per extent changes to 1048576 / 4096 = 256 pages per extent. The frequency of the bookkeeping pages changes to every 4096 pages. So we now waste 254 / 4096 = ~6.2% of disk space for this bug. An aside: When is an extent not an extent? An interesting aside to all of this is that although the manual claims it is so, in InnoDB an extent is actually not always 1 MiB. It is actually (1048576 / innodb_page_size) * table_page_size. As far as I can tell this was more or less a mistake in the InnoDB compression code; it should have used the table’s actual page size (which comes from KEY_BLOCK_SIZE aka zip_size for compressed tables) rather than the system default page size (UNIV_PAGE_SIZE) which was at the time fixed at compile-time. So, for a system with innodb_page_size=16k (the default), and a table created with ROW_FORMAT=COMPRESSED KEY_BLOCK_SIZE=8, the “extent” is actually only 512 KiB. If you mix the new configurable page size feature with InnoDB compression, due to the above weirdness with how extent size really works, you can get some pretty interesting results. For a system with innodb_page_size=4k and a table created with ROW_FORMAT=COMPRESSED KEY_BLOCK_SIZE=1, the system actually wastes 254 / 1024 = ~24.8% (!!!) of the disk space to this bug (in other words, every 4th extent will be an unusable fragment extent). I updated Bug #67963 to add the above and changed the title to “InnoDB wastes almost one extent out of every innodb_page_size pages” to be slightly more accurate with the reality. If you were thinking about using 4k pages in your systems, you may want to subscribe to the bug, and maybe hold off, unless you can afford to waste more than 6% of your disk space (in addition to all other waste). 1 And prior to MySQL 5.6, you could always have changed it by changing UNIV_PAGE_SIZE in the source code and recompiling. 2 As the page size is reduced, there is less disk space available to store the bitmaps that need to be stored in the XDES page, and reducing the amount of pages represented by each page proportionally with the page size is a good enough way to do it. What is happening? Why is it so slow? Why are some things slow and others not? How was the transaction evil? As described in The basics of the InnoDB undo logging and history system, these modifications are made to the database, and there is a single index structure used by both the uncommitted write transaction and my read transaction. 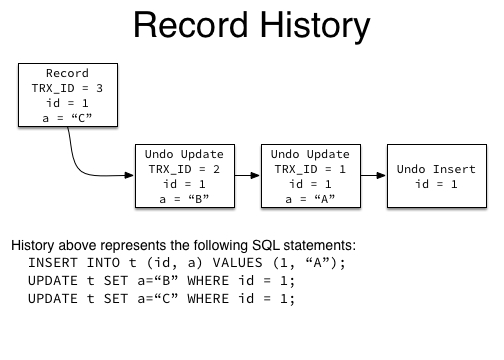 Although my read transaction is not able to see any of the rows inserted and subsequently modified by the writing transaction, in order to figure that out, it needs to apply all the undo records to each row encountered (10 each). This, of course, takes time. You can see some of the hidden visibility of the in-flight data “leaking” in the amount of time different operations take. For instance, scanning all rows takes more than 5 seconds, but using the condition a > 1000000 can be immediately evaluated. Suspiciously the condition a > 500000 takes approximately half as much time as scanning all rows (because it has half as much work to do). 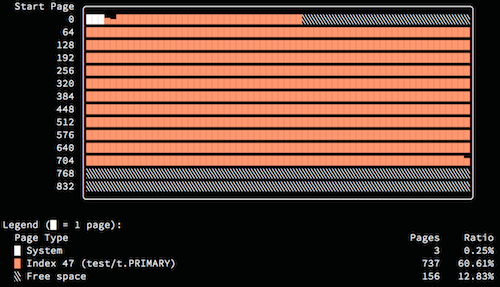 Of course, all of these queries return an empty set. While almost no one would intentionally do what my script does, I have actually seen the end result in production systems before: a very large transaction updated a row many times resulting in many slow queries trying to access the table. Some queries would be fast, some slow. Creating a single or many large transactions writing to as few as one row many times, directly accumulating undo history. Leaving open a transaction (while minimally keeping it alive) with a read view, indirectly accumulating undo history by preventing purge. Both of these situations allow a regular user, without special privileges, to consume large amounts of disk space in the system tablespace, potentially causing the system tablespace to be expanded to consume all filesystem space and without an easy recourse from the system administrator. Limit the undo space consumed by a single transaction. Limit the aggregate undo space consumed by a given user. Limit the age of the transaction read view for a given user. InnoDB implements multi-version concurrency control (MVCC), meaning that different users will see different versions of the data they are interacting with (sometimes called snapshots, which is a bit of a misleading term). This is done in order to allow users to see a consistent view of the system without expensive and performance-constraining locking which would limit concurrency. (This is where the “concurrency control” part of the term comes from; one alternative is locking everything the user may need.) Undo logging and InnoDB’s “history” system are the mechanisms that underly its implementation of MVCC, but the way this works is generally very poorly understood. The key thing to know in InnoDB’s implementation of MVCC is that when a record is modified, the current (“old”) version of the data being modified is first stashed away as an “undo record” in an “undo log”. It’s called an undo log because it contains the information necessary to undo the change made by the user, reverting the record to its previous version. Every record contains a reference to its most recent undo record, called a rollback pointer or ROLL_PTR, and every undo record contains a reference to its previous undo record (except for an initial record insert, which can be undone by simply deleting the record), forming a chain of all previous versions of a record. In this way, any previous version of a record can be easily constructed, as long as the the undo records (the “history”) still exist in the undo logs. Any transaction1, no matter how small or temporary it may be, is always operating on the database. As records are added, modified, and deleted, this is done in the very same index structure that all other transactions and users are actively using. Although the data for these in-flight transactions may not be visible to other transactions (depending on their transaction isolation level), the effects—particularly the performance costs—associated with those modifications are immediately visible. When a transaction updates a record, without yet committing, all other transactions using transaction isolation are immediately impacted by having to revert the version of that record to an older version (that they are allowed to see) every time they encounter the record in a read. What about transaction isolation levels? READ UNCOMMITTED — Also known as “dirty read”, because it literally always uses the newest data in the index without regard to transaction isolation at all, potentially reading data which isn’t currently (and may never be) committed. Even within a single statement, transactional inconsistencies may be seen from one record to the next, because no record is ever reverted to a previous version during a read. READ COMMITTED — A new read view is used for each statement, based on the current maximum committed transaction ID at statement start. Records read or returned within the statement will still be consistent with each other, but from statement to statement the user will see new data. REPEATABLE READ — The default for MySQL/InnoDB. A read view is created at transaction start, and that read view is used for all statements within the transaction, allowing for a consistent view of the database from statement to statement. That is, reads of data are “repeatable” within the transaction. In the normal course of accessing an index, some small number of records will need to be reverted to a previous version in order to satisfy the transaction isolation requirements imposed by the system. This has a cost, but as long as the read view of the transaction is fairly new, most records will not require reversion, and there is very little performance cost to doing this. Extremely old read views. A long-running transaction (especially in the default REPEATABLE READ isolation level) will have an old read view. In a write-heavy database this may require reverting the version of very many rows to very old versions. This will slow down the transaction itself and in the worst case may mean that very long-running queries in a write-heavy database can never actually complete; the longer they run the more expensive their reads get. They can spiral into performance death eventually. Delaying purge. Because a long-running transaction has an old (potentially very old) read view, purging of undo logs (history) for the entire system will be stalled until the transaction completes. This can cause the total size of the undo logs to grow (rather than re-using the same space over and over as it normally would), causing the system tablespace (ibdata1) to grow—and of course due to other limitations, it can’t be shrunk later. If a very long-running transaction (or query) is needed, it’s well worth considering whether it could use dirty reads in READ UNCOMMITTED isolation level in order to avoid these problems. Whenever a record is deleted, other transactions may still need to see the record as it existed, due to transaction isolation. If, upon delete, the record was immediately removed from the index, other transactions wouldn’t be able to find it, and thus would also not be able to find its reference to the previous record version they may need. (Keep in mind that any number of transactions may see the record in any number of versions, so five different transactions may see up to five separate versions of the record.) In order to handle this, DELETE doesn’t actually delete anything: instead it delete marks the record, flipping a “deleted” flag on. In addition to every record having a reference to its previous version, there is also a global view of the history of the entire database, called the “history list”. As each transaction is committed, its history is linked into this global history list in transaction serialization (commit) order. The history list is used primarily for cleaning up after a transaction, once no existing read view still needs its history (all other transactions have completed). Freeing undo log pages and unlinking them from the global history list to make them available for re-use. InnoDB exposes the total amount of history present in the system as a “History list length”, which can be seen in SHOW ENGINE INNODB STATUS. 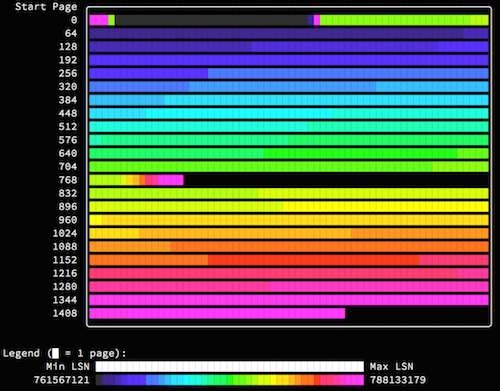 This is the count of all database modifications present in the undo logs, in units of undo logs (which may contain a single record modification or many). Next, the physical structure of the undo logs, undo records, and history will be examined. 1 Note that InnoDB does not start a transaction internally when a BEGIN or START TRANSACTION is issued; this happens only after the first read, or immediately if START TRANSACTION WITH CONSISTENT SNAPSHOT is executed. 2 Of course actually deleting the record still doesn’t actually delete it — it just links the record into a “garbage” list, where record space may be reused. However nothing is guaranteed to be really removed from a page until the page is re-organized.